County Councilmember Valerie Poindexter joined Mayor Billy Kenoi and the Honokaa community Monday at a dedication and grand opening of the Rose Andrade Correia Stadium at the Honokaa Rodeo Arena, home to one of the oldest rodeos in Hawaii. The celebration of the $3.1 million project included a blessing by Deacon Larry Ignacio and a presentation by the Andrade Ohana. 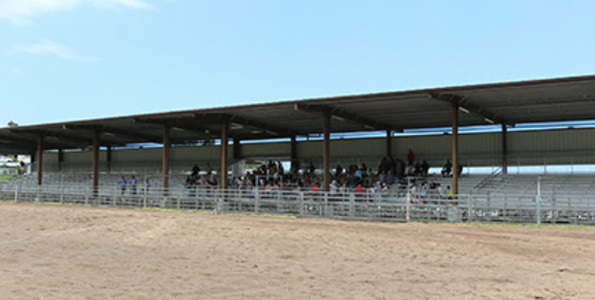 The facility is named for lifetime Honokaa resident Rose Andrade Correia, a member of the Hawaii Saddle Club who helped develop the vision that led to the construction of the Honokaa Rodeo Arena. “This rodeo arena is one of the important gathering places in Hamakua. It was important to make this beautiful, and to make it to last for generations to come,” Poindexter said. The covered 1,200-seat Rose Andrade Correia Stadium replaces old bleachers that were exposed to the elements. The project also included replacement of the comfort station and judges’ stand, improvements to the pavilion, a new concession stand, and ramps and parking spaces to make the facility fully accessible to people with disabilities. Among the first people to ride in the new arena was Leiana Rose Andrade Stout, 13, who showed her skills running around barrels on her horse Piko. Andrade Stout is the great-granddaughter of Rose Andrade Correia. “My great grandma didn’t do this for her. She did this for me, and my children, and my grandchildren. I think she would be pretty proud,” Andrade Stout said. Construction was done by Site Engineering Inc., and Goodfellow Bros., Inc. The consultant was Inaba Architecture. The dedication and opening blessing included calf roping, barrel racing, and entertainment from the Honokaa Senior Club. Monday’s opening kicked off Honokaa Western Week. 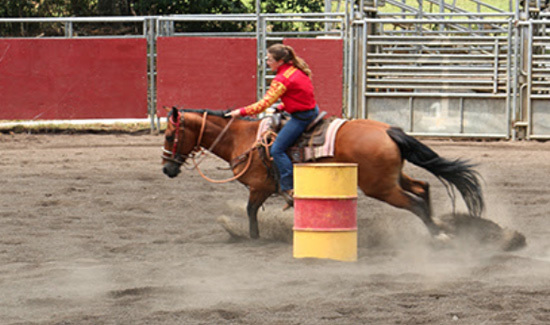 The rodeo arena’s first event will be the 58th Hawaii Saddle Club Scholarship Rodeo on Sunday, May 25 and Monday, May 26, which will include more than 350 contestants from Hawaii and the mainland.